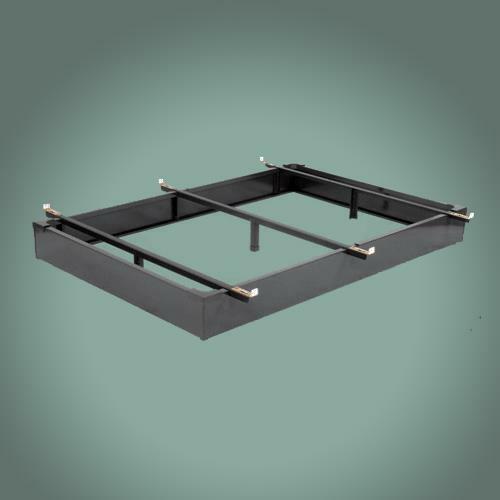 Metal bed bases provide the support needed to extend the life of any box spring and mattress. The flush-to-floor design prevents dust and lost items from accumulating beneath the bed. The base is constructed from 22-gauge structural steel and features three high-carbon angle iron cross supports, each with a center leg. Easy-to-adjust mattress retainer clips hold the box spring securely in place. No tools are required for assembly. This model has 10 inch high sides and fits California King beds. A java brown finish adds warmth while blending with the room's style. King Size 72" x 72"
This is a special order product; freight charges published on website may not be accurate. Our customer service team will email you an official quotation with accurate freight charges, for your approval before processing order.